The Temple Mount Institute fights for approval to offer the Passover sacrifice on the Temple Mount. The Temple Mount Institute has filed suit in its fight for the right to sacrifice a sheep on the Temple Mount prior to Passover, as commanded in the Torah. "The command to perform a Paschal [Passover] sacrifice is a positive commandment; the punishment for failing to perform it is 'karet' [lit. -- 'cut off', meaning that a person is cut off from the Nation of Israel], and it can be performed only on the day before Passover and only on the Temple Mount,” the organization explained in a petition to the Supreme Court. Fighting the group's request are the Israel Police, who argue that the sacrifice would lead to Muslim riots and thus threaten public safety. 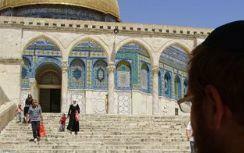 Jews have the right to offer animal sacrifices on the Temple Mount under Israeli law, the organization claimed. Israelis are guaranteed the right to freedom of worship, and Israel prides itself in allowing members of all faiths to access their holy sites. In previous years, the court has ruled that the right to freedom of worship is outweighed by the consideration of public safety, and has forbidden the Paschal sacrifice. The Temple Mount Institute also took the opportunity to take police to task for barring Jews and Christians from the Temple Mount following Muslim riots. “The Israel Police is giving rioters a 'prize' and encouraging them to hold violent riots and disturb the peace, on the one hand, and is discriminating against Jews and members of other faiths and trampling their human rights – the right to freedom of movement and freedom of worship – on the other,” the organization accused. The Institute asked the court to order police to explain why Jews are barred from the mount when Muslims riot.